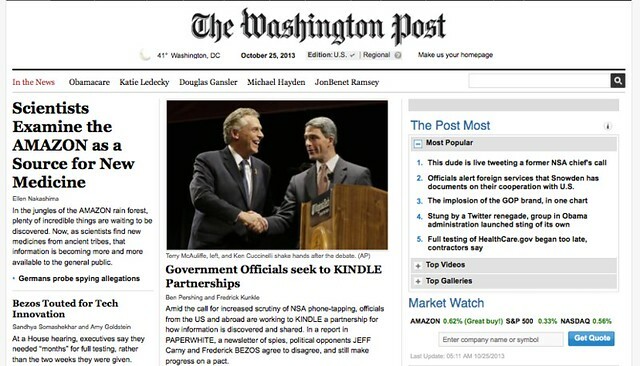 Two of this week’s Daily Create for DS106 built off the theme of the Open Web, and the main assignment this week for the Headless Course was to create a story inside the web. 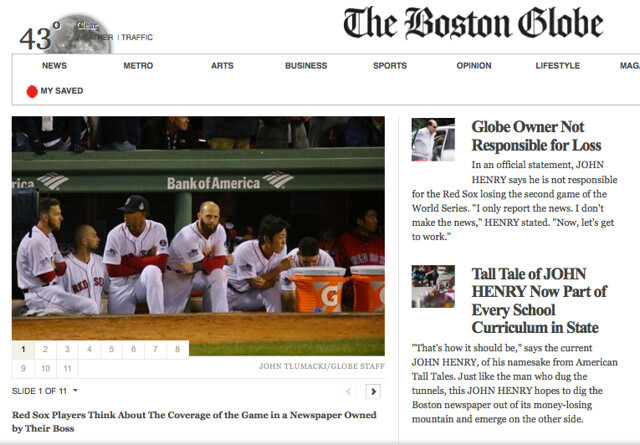 I did share out my work around revamping some of the frontpages of large newspapers now owned by powerful men. The other day, the Daily Create asked for a silent animation to represent the Open Web. I decided to use Stykz in between parent-teacher conferences to quickly put something together. My theme was “data needs to be free” and I did my best to represent it in this short animation. I don’t know. Did it work? I’m not so sure it did, but I got stuck for time and did the best I could. Those little green bars? They’re not candy bars. They’re data points. The circle? Not the moon. That’s the web. The stick figure? OK, that’s you. And me. And all of us. And finally, yesterday, the Daily Create asked us to create something to represent the positive connotations of hacking. I don’t know about you but I keep shaking my head at the events around the mess of the US healthcare site. 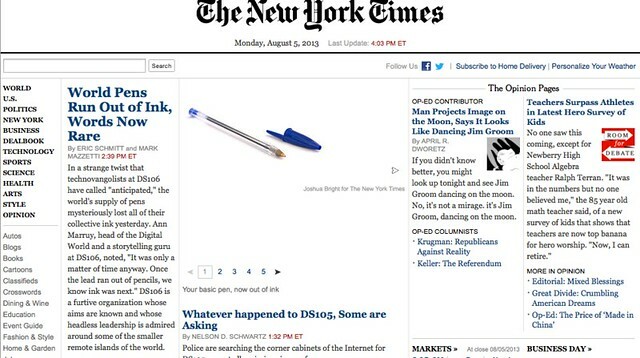 I wonder: how in the world in this day and age could a website end up such a mess? (Answer: put it in the hands of the government.) 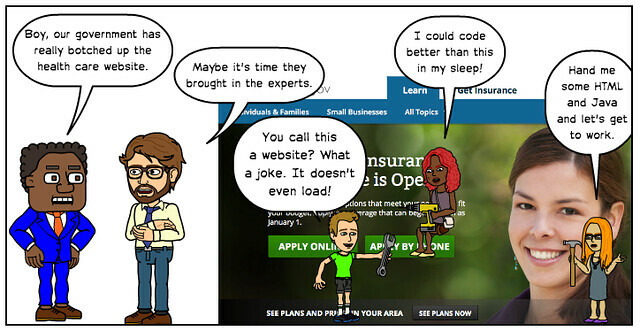 This comic for the Daily Create was designed to make fun of the “fix” process and point out some “real experts” in the world. And of course, the Open Web and Hacking is at the center of the Merry Hacksters radio show, Hack the World. On Tuesday night, the collaborative radio show venture that I was part of — The Merry Hacksters — had a premiere on DS106 Radio. I represented our group during the chat with Alan Levine and Christina Hendricks. The collaborative experience was interesting, to say the least, as we worked almost exclusively off Google Docs, Twitter and Dropbox to gather ideas, share audio files and make suggestions for the show’s sequence. We never “talked” to one another, as some other groups did with Google Hangouts, etc. This project evolved over about four weeks of time, starting with an idea I had during the initial brainstorming of building off my summer experiences in Teach the Web and the Making Learning Connected MOOC, both of which honored the ethos of the hack. Assorted radio bumpers and commercials. We will also be making most of the individual audio files available for folks, too, if you just want to hear a piece or want to remix the entire show in your own way. We hope that sharing will be in the spirit of our own work. Go forth and hack the world! 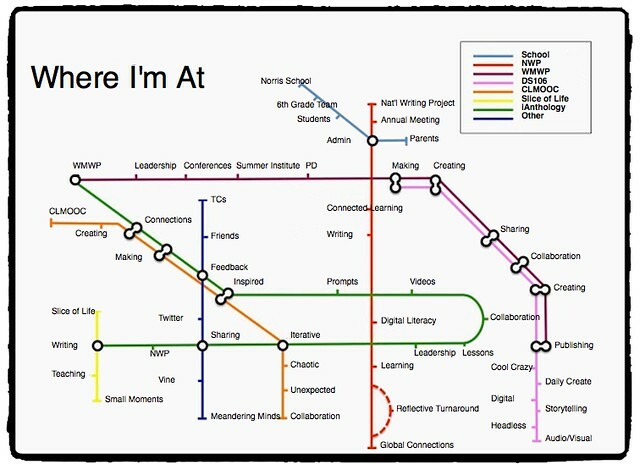 This week, I dove back into Chad’s Tube Map Me and started to think about how to map out the connections that I have a writer and teacher. (If you have never used Thimble, Chad has helpfully done most of the work and annotated his code with notes about where you write. It takes a few minutes to get orientated to the set-up – code on the left, preview on the right — but Thimble is a great teaching tool and makes the building of a webpage more visible to the user, and remixer). The activity was intriguing and enjoyable, although I found at a certain point that there were too many stations for ideas, so you notice a bunch of repeated station stops. I suppose that’s OK since writing, learning and collaboration are frequent themes to the various online networks where I call home. Or virtual home, anyway. I realize now, too, that I could have been a bit more thoughtful and purposeful in where the tube lines connect with each other. Oh well. Where does the tube lead you? My friend, Chad Sansing, created this very neat hackable, remixable Thimble page with Mozilla Webmaker that allows you to create a page for band. Preferrably, a fake band. 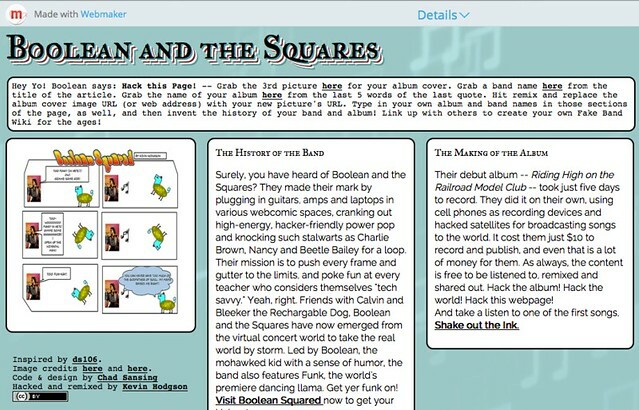 It’s called the Fake Band Wiki, and so I dabbled with Chad’s code to create this homage to a fake band for a fake comic character from my old comic, Boolean Squared. It’s been a few years now since I have done anything with Boolean and so it was a kick to get him back in my head and imagine that he had a band that was ripping up the music scene. What’s interesting to me is that Chad got inspired on this Webmaker theme from a DS106 project, and so I feel a bit of full circle here, as my friendship with Chad precedes my diving into DS106, and yet I am working on a DS106-inspired project created by Chad. Add in the Teach the Web MOOC from the summer, where we were Thimbling all the place (not to mention the National Writing Project) and …. well … I love all of those connections come together, you know? And, as with all Webmaker activities, we invite you to remix the web. Head to Chad’s project, or remix mine, and make your own Fake Band Wiki. When you remix the project (upper right corner of the page, click “remix”), all of Chad’s notes and instructions will be there for you to follow and learn from. It’s fun and engaging, and you create something to share with the world. What more do you want? A series of activities over at DS106 centers on the use of animated GIFs, and this particular activity has folks taking a dancing Jim Groom, from DS106, and putting him into new places. I decided to use Popcorn Maker, so that I could add a soundtrack (he’s dancing, after all). I don’t know Jim but he sure seems happy to be dancing. Yesterday, the high school students in our digital literacies workshop began using Thimble, the Mozilla Webmaker tool, to begin tinkering around with website creation. Soon, they will be creating a portfolio of some of their learning around hacking, remixing, game design and other strands of thinking, and I am leaning towards having them create their portfolio in Thimble. First, though, they need the basics of HTML coding. 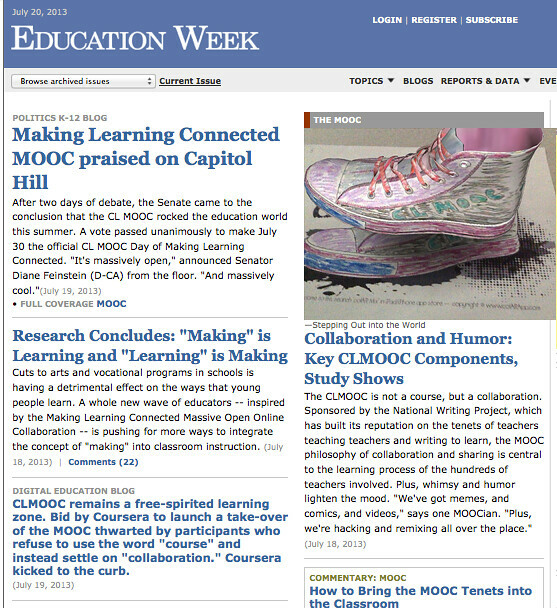 I used the Hackasuarus tool Xray Goggles to hack Education Week so that all the news (fit to print) is about the Making Learning Connected Massive Open Online Collaboration. 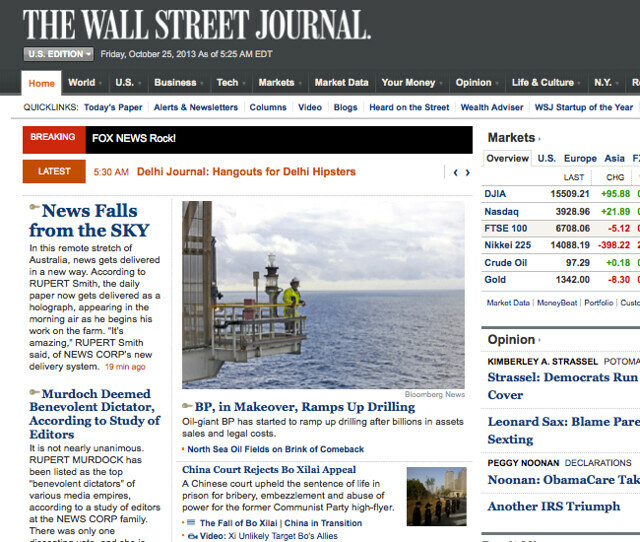 I mean, this is the way the homepage of the journal should look, right? You want to hack, too? Check out the Xray Goggles site, and use the tool to hack away. Go ahead and hack my hack, too. If you do, share out the link. Keep the ideas flowing ….